November 7, 2018. The call for a constitutional convention is defeated with 69.1% no votes, 23.7% yes votes, and 7.2% blank or over votes. Under the State Legislature’s interpretation of the law, blank and over votes are treated as no votes, which would give the revised outcome of 76.3% no votes and 23.7% yes votes. For details, see election results at the State of Hawaii Office of Elections or election results as reported by the Honolulu Star-Advertiser. November 6, 2018. Snider, J.H., ConCon Complaint: Campaign Spending Violation on Star-Advertiser’s Front page, Hawai`i Free Press, November 6, 2018. See also the follow-up article, Snider, J.H., Hawaii’s Failed Campaign Finance Law: The Case of the Star-Advertiser’s Missing Front Page Ad Disclaimer, Hawaii Press Press, January 19, 2019. November 5, 2018. Editorial scorecard heading into the Nov. 6 constitutional convention election: 4 newspapers endorse a convention call (Civil Beat, West Hawaii Today, The Garden Island, and Hawaii News Now); 1 opposes (Honolulu Star-Advertiser). November 5, 2018. The No Coalition places an ad on the front, page, upper right, of the Honolulu Star-Advertiser. The ad violates Hawaii’s law requiring a disclaimer including the name of the committee placing the ad. Someone in the Star-Advertiser‘s ad department would clearly have known that the ad lacked the required disclaimer but probably didn’t care because the requirement lacks an effective enforcement policy, with the worst penalty for the committee placing the ad a $25 fine and $0 for the newspaper running the ad. An unsophisticated reader might assume that the headline was an editorial, not an ad. November 3, 2018. Snider, J.H., Who Spent What, When, and Where on the Con-Con Referendum, Hawai`i Free Press, November 3, 2018. November 1, 2018. Snider, J.H., Con-Con: Hawaii’s only hope for term limits, Hawai`i Free Press, November 1, 2018. October 30, 2018. The State of Hawaii Spending Commission reports that the No Coalition (“Preserve Our Hawaii”) spent $612,513 on ads through Oct. 22, 2018–the last date before the Nov. 6, 2018 election when such expenditures must legally be reported. There was no organized yes coalition and so no expenditures. The No Coalition’s electronic ad campaign began on Sept. 28 and print media campaign on Oct. 4. TV ads were run on KIKU, KITV, CW (NHON), Spectrum, KBFD, KHNL, KGMB, and KFVE; radio ads on KNDI, KKEA, KKOL, KDDB, KUMU, KRTR, KINE, KPHW, KUCD, KDNN, KZOO, KPOA, KJMD, KJKS, KLHI, KITH, KJMQ, KFMN, KQNG, KSHK, KSRF, KUAI KRYL, KRKH KHBC, KWXX/KAOY, KNWB-KMWB, KAP,KKBG, KKPV; print ads in Honolulu Star-Advertiser, Hawaii Tribune, West Hawaii Today, Maui News, and The Garden Island; and digital ads via Goodway, Spotx, Hawaiinewsnow.com, and Staradvertiser.com. October 27, 2018. Snider, J.H., The War Between Civil Beat and Star-Advertiser on the Con-Con Referendum, Hawai`i Free Press, October 27, 2018. October 24, 2018. Civil Beat’s eighth editorial endorsing a yes vote for a Hawaiian state constitutional convention. This one provides its most comprehensive overview of the issues a convention could address. This one also includes the first political cartoon on the convention referendum. October 23, 2018. Civil Beat releases an excellent two-minute animation explaining Hawaii’s constitutional convention process (see Hawaii Civics 101: What’s A ConCon? at the upper right of this page). October 22, 2018. The Honolulu Star-Advertiser editorializes against holding a convention, arguing that the success of Hawaii’s 1978 convention wouldn’t be repeated. October 21, 2018. Snider, J.H., Con-Con Opponents’ Nostalgia for Hawaii’s Golden Age of Democratic Reform, Hawai’i Free Press, October 17, 2018. October 18, 2018. Civil Beat’s seventh editorial endorsing a yes vote for a Hawaiian state constitutional convention. This one focuses on a handful of democratic reforms that the people shouldn’t trust the State Legislature to pass on its own. October 17, 2018. Snider, J.H., The Advertised Cost of a Constitutional Convention, Hawai’i Free Press, October 17, 2018. Also published in The Garden Island on October 18, 2018. October 17, 2018. Civil Beat poll finds constitutional convention yes vote, but not legislative bypass issues, losing support. October 14, 2018. The No Coalition launches its ad campaign with three duplicate ads (pages A3, A5, and A7) in the Sunday edition of the Honolulu Star-Advertiser. The ads read: “If we can’t afford to repair public facilities, why spend $55 million on ConCon? Vote ‘No!’ On the Constitutional Convention Ballot Question.” The ads are accompanied by an op-ed, echoing the ad’s messaging, from one of its leading spokespeople during the 2008 No Coalition campaign. October 13, 2018. Snider, J.H., Why Con-Con Opponents Willfully Ignore Legislative Bypass Issues, Hawai’i Free Press, October 13, 2018. October 12, 2018. The Hawaii State Teachers Association, the leading constitutional convention opponent in 2008, goes into high gear opposing the convention referendum. It plasters its home page with an anti-concon graphic and issues a press release stating its opposition to calling a convention. October 11, 2018. 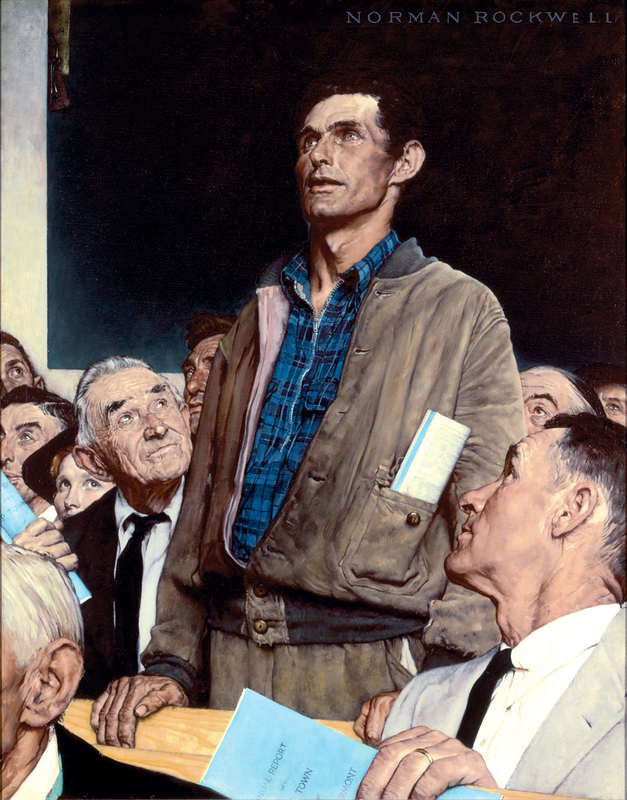 The “Citizens’ Jury for the Constitutional Convention Ballot Question” releases its findings. Details can be found under the “News” menu. October 10, 2018. Snider, J.H., To Oppose A ConCon Is To Oppose Constitutional Democracy, Civil Beat, October 10, 2018. October 10, 2018. At the Native Hawaiian Convention, former Congresswoman Colleen Hanabusa and former Governor Neil Abercrombie take opposing sides on the constitutional convention referendum, with Hanabusa opposing and Abercrombie supporting. October 9, 2018. Civil Beat’s sixth editorial endorsing a yes vote for a Hawaiian state constitutional convention. This one focuses on the no campaign’s expected fear-mongering, which has been central to no campaigns in recent decades. October 5, 2018. Civil Beat has a brief and useful overview of Hawaii’s Constitution. October 4, 2018. The leading group behind the no campaign, Preserve Our Hawaii, quietly launches its website, Don’t be ConConned, including a list of its coalition partners. On October 7, 2018, it runs its first TV ad, effectively marking its public launch. October 2, 2018. Civil Beat’s fifth editorial endorsing a yes vote for a Hawaiian state constitutional convention. This one provides its broadest discussion yet of questions a state constitutional convention should address. October 1, 2018. Hawaii’s Campaign Spending Commission issues its first report on ballot issue expenditures and reports no expenditures on the convention issue through September 26, the end of the reporting period. NoConCon.org is publicly announced four days after the end of that period. Preserve Our Hawaii, the only registered entity, reports no receipts or expenditures. September 30, 2018. Hawaii’s Thousand Voices orchestrates the formation of NoConCon.org, the first coalition of groups to publicly announce opposition to voting yes on the Nhttps://www.noconcon.org/ovember state constitutional convention referendum. September 26, 2018. Civil Beat poll finds only a 21% approval rating for the state legislature. September 25, 2018. Civil Beat’s fourth editorial endorsing a yes vote for a Hawaiian state constitutional convention. This one focuses on a convention as a means to create a citizen initiative option in Hawaii. September 23, 2018. West Hawaii Today reports on the first forum to discuss the pros and cons of the upcoming state constitutional convention referendum. September 21, 2018. Snider, J.H., Want Term Limits? A Con Con Is Your Only Hope, Civil Beat, September 21, 2018. September 18, 2018. Civil Beat’s third editorial endorsing a yes vote for a Hawaiian state constitutional convention in 2018. September 6, 2018. The Legislative Reference Bureau, an arm of the State Legislature’s leadership, releases and widely distributes its report on how a state constitutional convention would work. The report reasonably accurately summarizes the law. But it continues the Legislative Reference Bureau’s tradition of providing information strongly biased against calling a convention. It accomplishes this by not discussing the key benefit of a convention (why Hawaii’s Framers provided a method of constitutional amendment that could bypass the State Legislature) while grossly exaggerating the cost of a convention without citing either the cost of Hawaii’s last convention or competing authoritative studies, notably a task force convened by the lieutenant governor, with different cost estimates. September 5, 2018. A prominent Hawaii political scientist and an expert on democratic deliberation have teamed up to provide a citizens’ jury style forum to discuss and then issue a pro & con statement about the upcoming state constitutional convention referendum. See Lovell, Blaze, Panel To Study Constitutional Convention Question Before Election, Civil Beat, September 5, 2018. August 14, 2018. Hawaii News Now (KHNL-CBS, Honolulu; KGMB-NBC, Honolulu’;KHBC, Hilo; KOGG, Maui) editorial endorses a yes vote for a Hawaiian state constitutional convention in 2018. August 13, 2018. Snider, J.H., The State Con-Con Papers, Social Science Research Network, August 13, 2018. A compilation of 42 short essays by J.H. Snider on the history, democratic function, and politics of the periodic state constitutional convention referendum. August 3, 2018. Snider, J.H., Analysis of Candidate Position Statements on the Nov. 6 ConCon Referendum, Hawai’i Free Press, August 3, 2018. August 3, 2018. For the Governor, Lt. Governor, and State Legislature races, the Hawai`i State Constitutional Convention Clearinghouse compiled and categorized the candidates’ positions statement on the Nov. 6 constitutional convention referendum. July 25, 2018. Civil Beat’s second editorial endorsing a yes vote for a Hawaiian state constitutional convention in 2018. June 14, 2018. 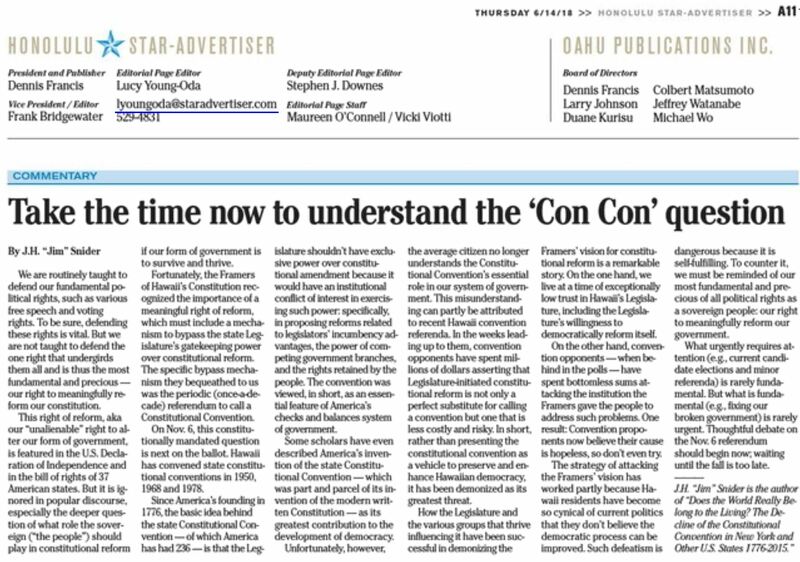 Snider, J.H., Take the time now to understand the ‘Con Con’ question, Honolulu Star-Advertiser, June 14, 2018. Covered in the Hawaii Free Press, June 14, 2018. June 8, 2018. Fourth in Civil Beat‘s four-part series:Adler, Peter, and Jenna Leigh Saito, Political Volatility Could Affect Hawaii Constitutional Convention Question, Civil Beat, June 8, 2018. June 7, 2018. Third in Civil Beat‘s four-part series: Adler, Peter, and Jenna Leigh Saito, What A Constitutional Convention Might Cost Hawaii Taxpayers, Civil Beat, June 7, 2018. June 6, 2018. Second in Civil Beat‘s four-part series: Adler, Peter, and Jenna Leigh Saito, Before Deciding On A New Constitutional Convention, Consider Those Held Before, Civil Beat, June 6, 2018. June 5, 2018. First of a four-part series in Civil Beat that doesn’t take a position either for or against the upcoming referendum. Adler, Peter, and Jenna Leigh Saito, Should We Open The Door To Changing How State Government Runs?, Civil Beat, June 5, 2018. May 25, 2018. Hawaii’s second state constitutional convention poll finds 54% of Hawaiian voters support calling a convention. May 8, 2018. Hawaii’s Upcoming State Constitutional Convention, ThinkTech Hawaii interview with host Jay Fidell and guest J.H. Snider. April 30, 2018. Snider, J.H., State Constitutional Convention Was Hijacked In ’96 — It May Happen Again, Civil Beat, April 30, 2018. A substantially more detailed version of the same op-ed can be found at Con-Con: The People v. Hawaii Supreme Court, Hawai’i Free Press, April 30, 2018. March 22, 2018. 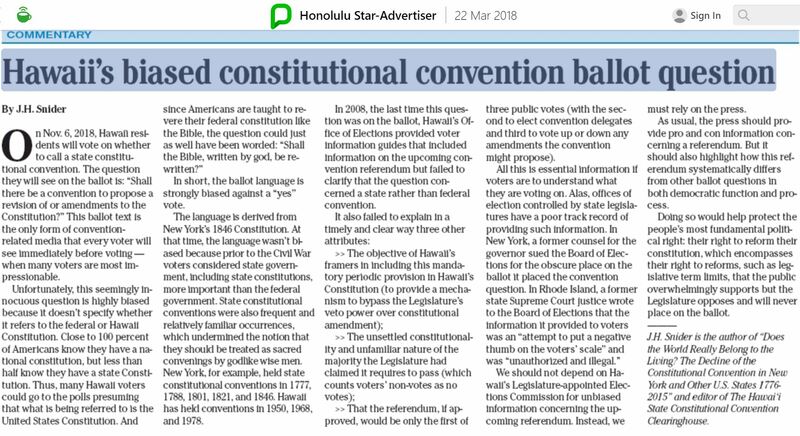 Snider, J.H., Hawaii’s biased constitutional convention ballot question, Honolulu Star-Advertiser, March 22, 2018. Covered in the Hawaii Free Press, March 22, 2018. December 18, 2017. Civil Beat editorial endorses calling for a Hawaiian state constitutional convention in 2018. It is the first newspaper editorial on the 2018 state constitutional convention referendum. December 11, 2017. Hawaii’s first state constitutional convention poll finds 67% of Hawaiian voters support calling a convention. Poll results, including on legislative bypass issues a convention could address, were reported in Civil Beat over multiple days. The December 12 article in the series reported, for example, that 68% supported state legislator term limits, a classic legislature bypass issue. December 7, 2017. Snider, J.H., Preparing For Hawaii’s Next Constitutional Convention Vote, Civil Beat, December 7, 2017. Covered in Con-Con: Referendum set for Nov. 6, 2018, Hawaii Free Press, December 7, 2017. Section 2. The legislature may submit to the electorate at any general or special election the question, “Shall there be a convention to propose a revision of or amendments to the Constitution?” If any nine-year period shall elapse during which the question shall not have been submitted, the lieutenant governor shall certify the question, to be voted on at the first general election following the expiration of such period. Section 3. The legislature may propose amendments to the constitution by adopting the same, in the manner required for legislation, by a two-thirds vote of each house on final reading at any session, after either or both houses shall have given the governor at least ten days’ written notice of the final form of the proposed amendment, or, with or without such notice, by a majority vote of each house on final reading at each of two successive sessions. March 11, 2016. Hawaii House of Representatives Concurrent Resolution Number 86. Places the state constitutional convention referendum on the 2018 ballot. The legislative history can be found here. February 22, 2018. Introduction of Hawaii House Concurrent Resolution 39, requesting the Legislative Reference Bureau to study the cost of convening a Constitutional Convention. March 9, 2018. Introduction of Hawaii Senate Concurrent Resolution 88, requesting the Legislative Reference Bureau to study the cost of convening a Constitutional Convention. March 10, 2018. Introduction of Hawaii Senate Concurrent Resolution 132, requesting the Legislative Reference Bureau to develop a framework for a Potential Constitutional Convention. March 21, 2018. Hearing on Hawaii House Concurrent Resolution 39 requesting the Legislative Reference Bureau to study the cost of convening a constitutional convention. April 23, 2018. All three resolutions above miss the second crossover date for concurrent resolutions. HCR39 had passed out of the House but not the Senate. September 6, 2018. Amending The Constitution, Public Access Room Newsletter, Legislative Reference Bureau, September 2018. No author is listed, but it can be presumed that this document was approved by the State Legislature’s leadership. October 1, 2018. Campaign Spending Commission campaign finance disclosures for non-candidate (e.g., constitutional Save & Exit convention) expenditures. Reports expenditures through September 26. October 29, 2018. Updated Campaign Spending Commission campaign finance disclosures for non-candidate expenditures. Reports expenditures through October 22. November 5, 2018. Updated Campaign Spending Commission campaign finance disclosures for non-candidate expenditures. Reports expenditures through November 2. November 6, 2018. The referendum date on whether to call a state constitutional convention. Implementation instructions from the State of Hawaii Office of Elections can be found here. Implementation guidelines in the Hawaiʻi Revised Statutes, Title 2: Elections, can be found here. *On June 17, 1959 Hawaiians both voted for statehood and several amendments to its constitution, which Hawaiians also had to approve before Congress would grant them statehood. On August 21, 1959, Hawaii was granted statehood. * Source: “Expenses of the Convention,” Proceedings of the Constitutional Convention of Hawaii of 1978, Volume 1, pp. 1191-1205. Note that convention expenses are highly politicized in constitutional convention politics because they are central to no campaigns and hundreds of thousands or even millions of dollars are spent advertising the highest conceivable cost to a convention. A high cost fits into the narrative that a convention is not worth the money. The total cost here is in 1978, not current dollars. It excludes some items that would be higher in a contemporary convention (e.g., payroll taxes and computers) while adding others that would be lower (e.g., messenger boys and printing costs). According to the C.P.I. Inflation Calculator provided by the U.S. Bureau of Labor Statistics, $1 in October 1978 dollars is worth $3.78 in October 2017 dollars, which would make $2,032,401 in October 1979 dollars come to $7,682,476 in October 2017 dollars. As an aside, Hawaii’s 1950 constitutional convention cost $175,709 in 1950 dollars, excluding the cost of a special election to elect delegates ($114,056) and the post-convention cost ($5,235) to publish information about the convention’s proposals. See “Constitutional Convention Costs,” Office of the Legislative Auditor, February 1967. Subscribe to HawaiiConCon.info to receive occasional newsletters, probably not beginning before Fall 2018. All fields must be entered to subscribe. To send news tips or feedback, use the contact form under the contact menu item. The best brief summary (two minutes and 35 seconds) of both Hawaii’s constitutional convention process and illustrative pro & con arguments. This podcast is the best intermediate length (12 minutes, 32 seconds) overview of the constitutional convention process, including pro & con arguments. Click on the link to open the podcast. The program above is better, but this one includes the editor of HawaiiConCon.info. This website refers to many old documents, including government documents, that use the traditional English spelling of Hawaii rather than the sometimes contemporary spelling, Hawaiʻi. This website has adopted the following compromise: use Hawai`i in the header and Hawaii in the body.